Thanks for joining me today. We'll be back tomorrow for Hearts' encounter with Aberdeen at Tynecastle, which begins at 14:15 BST, and Dundee's visit to Celtic, kick-off at 15:00 BST. Have a great evening. Motherwell's Kieran Kennedy shows what it means to lose a derby match.Image caption: Motherwell's Kieran Kennedy shows what it means to lose a derby match. Partick Thistle manager Alan Archibald is still looking for his first league win of the season, with three draws and five losses so far.Image caption: Partick Thistle manager Alan Archibald is still looking for his first league win of the season, with three draws and five losses so far. Things are looking up for Kilmarnock as Rory McKenzie celebrates his deflected winning goal against St Johnstone.Image caption: Things are looking up for Kilmarnock as Rory McKenzie celebrates his deflected winning goal against St Johnstone. "You see nerves creeping in. We need to use the ball better than we did. Like last week, you're scratching your head. We need belief to go and get that second goal." Jamie and Andy Murray win their men's doubles match against Australia 4-6 6-3 6-4 6-7 6-4. What a match! Rangers' 2-1 win at Dumbarton at the comically named Cheaper Insurance Direct Stadium means they have 21 points from seven games. Second-placed Falkirk fall two points further back from Rangers with a 1-1 draw at Alloa, who scored in the 90th minute. Hibs enjoyed a 1-0 win at the even more hilariously named Tony Macaroni Arena - home of Livi. No, Hibs' scorer was not Al Dente, but Liam Henderson. (Sorry.) And at Palmerston Park - fine name; stay classy, Doonhamers - there was an own-goal apiece in the 2-2 draw between Queen of the South and Morton. Motherwell have failed to score on seven of their last nine visits to New Douglas Park, reports my colleague John Barnes, a man with a well-thumbed, self-compiled book of Scottish soccer stats. If my sums are right, Ross County have now won 46 points from a possible 66 from their last 22 Premiership matches. That is a great league record that Jim McIntyre and Billy Dodds are compiling. Despite losing 1-0 to Ross County, Partick Thistle, with a mere three points from eight Premiership games, remain in touch with second bottom Dundee United. 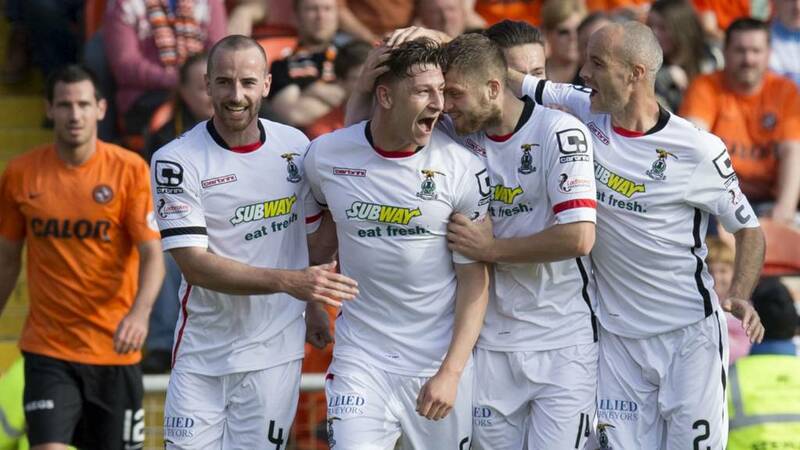 The Terrors drew 1-1 at home to Inverness and are on five points. Every player including the St Johnstone goalie is in the six-yard box for a late chance for the Perth side but it ends with a morale-boosting win for Killie. Rangers defender Danny Wilson concedes a penalty and Dumbarton are thrown a lifeline. We're into added time around the grounds. There are 11 minutes plus injury time remaining at Tannadice for either team to find a winner after Josh Meekings cancelled out Billy McKay's opener for the Terrors.Image caption: There are 11 minutes plus injury time remaining at Tannadice for either team to find a winner after Josh Meekings cancelled out Billy McKay's opener for the Terrors. Some players would have gone down in the box, but Hamilton's Gramos Kurtaj deserves credit for staying on his feet despite a nudge from the defender. He eventually turns, cuts past his man again, and curls just wide of the top corner. Hibernian's Liam Henderson celebrates after giving his side the lead at the...wait for it...Tony Macaroni Arena.Image caption: Hibernian's Liam Henderson celebrates after giving his side the lead at the...wait for it...Tony Macaroni Arena. With Rangers and Hibernian winning, second-placed Falkirk could not afford to drop points at Alloa. John Baird's penalty eases the nerves for the Bairns. Martyn Waghorn makes no mistake from the penalty spot. Rangers win a penalty. Gregor Buchanan sent off for a foul on Kenny Miller. Australia survive a match point against GB and win the fourth set. The Davis Cup semi-final goes into a deciding fifth set. Finally, Hamilton find the breakthrough. Dougie Imrie's looping header at the back post finds its way over Motherwell goalie Connor Ripley. Jamie and Andy Murray are a hair's breadth away from putting Great Britain into the Davis Cup final. They are 2-1 up in sets against Australia in Glasgow and lead 4-3 in the fourth-set tie-break. Martyn Waghorn's 30-yard strike beats Mark Brown in the Dumbarton goal and the Light Blues could be on their way to another league win. In the Championship, Queens and Morton are still drawing 1-1 and Hibs are a goal up at Livingston. But the games between Alloa and Falkirk, and Dumbarton and Rangers are goalless. Theo Robinson passes up a golden chance for the visitors. The ball makes its way across to him on the left hand side, and the Jamaican international was in acres of space, but he mis-hits his shot. His only saving grace is it deflects clear for a corner. Lovat have won the Camanachd Cup. They beat Kyles Athletic 2-1. Rory McKenzie sends in a cross that somehow finds its way over goalkeeper Alan Mannus and into the net. Bit of a fluke but Killie will take it. Blow for Kilmarnock as goalkeeper Jamie MacDonald comes off after being unable to shake off a knock picked up early in the second half. Conor Brennan comes on. Hamilton have started the second half in the same away they ended the first - on the front foot. Grant Gillespie and Gramoz Kurtaj both fire in efforts in an attempt to work goalkeeper Connor Ripley. Hibs forward Dominique Malonga and Livi's Morgan Neill vie for possession.Image caption: Hibs forward Dominique Malonga and Livi's Morgan Neill vie for possession. Liam Henderson's strike puts Alan Stubbs's side in front at Livi. Um, "second periods of play" are under way. Josh Magennis heads Kilmarnock level at Rugby Park.Image caption: Josh Magennis heads Kilmarnock level at Rugby Park. Dundee United's Aaron Kuhl tries to halt Inverness CT's Ryan Christie at Tannadice.Image caption: Dundee United's Aaron Kuhl tries to halt Inverness CT's Ryan Christie at Tannadice. "James Tavernier hit the post moments before the half-time whistle for Rangers but it's Dumbarton who created more over the opening 45 minutes. A really gutsy performance from the Sons who also hit the woodwork, but can they do it all over again after the break?" "The home side deservedly in front at half time at Tannadice. Jackie McNamara will be happy with his team's efforts and can only complain about not being further ahead. Work to be done for John Hughes if they are to get back into the game." It's a body blow for the Ton at Palmerston as they lose a goal on the stroke of half-time, Derek Lyle scoring his sixth of the season for the Doonhamers. "It is 417 minutes and counting since Partick Thistle last scored a goal but it took a fine save from their former goalkeeper Scott Fox to keep that unwanted run going at the interval. Fair to say it hasn't been a game of goalmouth excitement and at least the bottom club are still in the match with 45 minutes to go." David Wotherspoon gives St Johnstone the lead at Rugby Park.Image caption: David Wotherspoon gives St Johnstone the lead at Rugby Park. Josh Magennis leaps to powerfully head home Greg Kiltie's delicious cross. Billy McKay scores for Dundee United against his former club.Image caption: Billy McKay scores for Dundee United against his former club. Ali Crawford pings a shot off the bar as the home side begin to step up a gear against Motherwell. They have been on top for most of the last 10 minutes. Anonymous Accies fan: "The atmosphere at most of the Accies Motherwell games might be good if you're up in a press seat, if you're unfortunately near the trouble that can happen it's not so good." we are streaming on the BBC Sport website. Lovat last won the Cup in 1953. Motherwell fans are engulfed in the smoke from a flare at New Douglas Park.Image caption: Motherwell fans are engulfed in the smoke from a flare at New Douglas Park. Martin Woods gets physical with Partick Thistle's Sean Welsh.Image caption: Martin Woods gets physical with Partick Thistle's Sean Welsh. "Garry Fleming's header off the post for Dumbarton has been the best chance here with Rangers yet to get into their flow. The Sons of the Rock showing a steely resolve in what is their 300th competitive game at this stadium." Theo Robinson passes up a great opportunity for Motherwell. He manages to knock the ball onto his right foot, but fires over the bar from the edge of the area. "Big claim for handball from Accies as Morris plays it off McManus but the ref (correctly, I think) deems it not to have been deliberate." Rangers' Gedion Zelalem challenges for the ball against Dumbarton goalkeeper Mark Brown.Image caption: Rangers' Gedion Zelalem challenges for the ball against Dumbarton goalkeeper Mark Brown. "Jags fans chanting 'Partick Thistle reject' at County keeper Scott Fox and the home support singing 'There's only one Billy McKay' but at least they changed their tune when Liam Boyce scored the opener." Jamie Reckord crosses for Liam Boyce to head home for Ross COunty. Moments after Graham Cummins has a penalty claim denied, his Saints team-mate David Wotherspoon nets the opening goal. The midfielder got it at the second attempt after initially heading off the post. "The pink boots of Dumbarton's Willie Gibson cause some nervy moments for Rangers goalkeeper Wes Foderingham as the winger hits a free kick just wide." "Two goals all season and none at all in over six hours at kick-off for winless Partick Thistle but their last away victory in the league was at Dingwall in April." Big let-off there for Motherwell. The free-kick is lifted in and goalkeeper Conor Ripley misses it, and the ball ends up in the net behind him. However, referee Craig Thomson deems there was a foul on the goalkeeper and the goal does not stand. It just had to be Billy McKay who has opened the scoring at Tannadice. The former Caley Thistle player pounced to score from six yards. John Barnes reports that the police are in among the Motherwell fans to try to apprehend whoever is letting off flares. Both United and Caley Thistle have won only once this season in the league. United's last point was the draw against Dundee, in the third round of games this season. Since then, United have lost to Hamilton, Ross County, Celtic and Kilmarnock. We're under way at Rugby Park, where Killie take on St Johnstone.Image caption: We're under way at Rugby Park, where Killie take on St Johnstone. Livingston: Jamieson, Millen, Gallagher, Neill, Longridge, Glen, Gibbons, Pitman, Faria, Hippolyte, Buchanan. Subs: Cole, White, Gould, Georgiev, Sheerin, Currie, Duckrell. Hibernian: Oxley, Gray, Hanlon, Fontaine, Stevenson, McGeouch, Bartley, Henderson, McGinn, Malonga, Cummings. Subs: Feruz, Stanton, Boyle, Forster, McGregor, Reguero, Martin. We're at kick-off time at grounds around Scotland. Thanks for joining me this afternoon. "Both Tommy Wright and Gary Locke tell me they haven't been practising with 10 men during the week with Willie Collum in charge here in Ayrshire. "Collum made headlines in the Champions League in midweek when he sent two Gent players off in their match against Lyon." Alloa: David Crawford, McAusland, Marr, Hill, Hamilton, Robbie Crawford, McManus, O'Brien, Holmes, Flannigan, Duffy. Subs: McNeil, Reintam, Chopra, Ferns, Paun, Hetherington, Williams. Falkirk: Rogers, Vaulks, Watson, Peter Grant, Leahy, Smith, Taiwo, Kerr, Sibbald, Baird, Miller. Subs: Muirhead, McCracken, Alston, Bowman, McHugh, Cooper, Blair. Queen of the South: Thomson, Dowie, Brownlie, Christopher Higgins, Marshall, Kidd, Harris, Jacobs, Conroy, Oliver, Lyle. Subs: Coogans, Hutton, Heffernan, Millar, Rutherford, Atkinson, Smith. Morton: Gaston, Kilday, Gasparotto, O'Ware, Lamie, Barr, Forbes, Miller, Tidser, McCluskey, Johnstone. Subs: Samuel, Scullion, Adam, Sabajo, Cairnie, Thomas Orr, Stevenson. Dumbarton: Mark Brown, Gallagher, Barr, Buchanan, Docherty, Cawley, Routledge, Scott Brown, Gibson, Fleming, Brophy. Subs: Kirkpatrick, Donald McCallum, Waters, Ewings, Hopkins, Wright. Rangers: Foderingham, Tavernier, Ball, Danny Wilson, Wallace, Law, Zelalem, Halliday, Waghorn, Miller, McKay. Subs: Kiernan, Oduwa, Aird, Shiels, Kelly, Hardie, Thompson. Ross County: Fox, Fraser, Boyd, Robertson, Reckord, Gardyne, Irvine, Martin Woods, De Vita, Boyce, Graham. Subs: Gary Woods, McShane, Foster, Holden, Franks, Murdoch, Dingwall. Partick Thistle: Cerny, Dumbuya, Frans, Seaborne, Booth, Osman, Bannigan, Lawless, Stevenson, Welsh, Doolan. Subs: Miller, Amoo, Scully, Wilson, McDaid, Muirhead, Nisbet. Dundee United: Zwick, McGowan, Morris, Durnan, Dillon, Dow, Kuhl, Fraser, Rankin, McKay, Bodul. Subs: Taggart, McCallum, Murray, Telfer, Connolly, Spittal, Donaldson. Inverness CT: Fon Williams, Raven, Meekings, Devine, Tremarco, Draper, Tansey, Vincent, Christie, Williams, Storey. Subs: Esson, Lopez, Foran, Wedderburn, Horner, Polworth. "It's a position [bottom of the table] we have been in before but one we want to get out of as soon as possible. We are trying to be as positive we can and the important thing is to get the first goal in a game." "My learned colleague John Barnes says Jesus Garcia Tena is on Accies' bench because he arrived at New Douglas Park late having been stuck in traffic!" "Dundee United boss Jackie McNamara says his team have to turn good performances into positive results. McNamara has brought John Rankin and Darko Bodul back into the starting 11 for the game against Caley Thistle. United are looking for their first home league win of the season." "Annoyingly for St Johnstone, last week's hat-trick hero Steven MacLean will not be risked today on Killie's artificial surface because of his previous two serious knee injuries. John Sutton replaces him. "Gary Locke names an unchanged side, unsurprisingly." Kilmarnock: MacDonald, Westlake, Ashcroft, Findlay, McHattie, Kiltie, Hamill, Slater, Higginbotham, McKenzie, Magennis. Subs: Robinson, Boyd, Brennan, O'Hara, Obadeyi, Splaine, Balatoni. St Johnstone: Mannus, Fisher, Mackay, Shaughnessy, Brian Easton, Wotherspoon, Millar, Craig, O'Halloran, Cummins, Sutton. Subs: Scobbie, Lappin, Anderson, Davidson, Clark, Kane, Thomson. Hamilton: McGovern, Lyon, Gordon, Tagliapietra, Kurakins, Imrie, Gillespie, Crawford, Kurtaj, Docherty, Morris. Subs: Sendles-White, D'Acol, Redmond, Longridge, Garcia Tena, Martin, Nade. Motherwell: Ripley, Law, McManus, Kennedy, Chalmers, Grimshaw, Lasley, Taylor, Ainsworth, Robinson, Moult. Subs: Laing, Johnson, Twardzik, Clarkson, Jack Leitch, Thomas, McDonald. "Both sides ringing the changes for today's first Lanarkshire derby of the season. Accies, following the midweek defeat by Aberdeen, leave out Nade, Garcia Tena and MacKinnon, with Morris, Docherty and Lyon replacing them. Ian Baraclough brings in Grimshaw, Chalmers, Kennedy and Robinson for Laing, Thomas, Hammell and McDonald." [A message for United fans] "Watch what you wish for. Jackie has done a tremendous job. He has gone down the line of recruiting young players and they are getting better and better. Most of these young guys will have a great career and maybe play for the national team. Jackie has played for Glasgow Celtic. That is real pressure where you have to win every week. Sometimes it's good pressure. He'll come out swinging, that's for sure." "What we are looking for is consistency across 90 minutes. What we did last season was absolutely outstanding. Maybe we've had a wee bit of a hangover coming back. We have lost players. We are up against [former ICT player] Billy McKay today and we will have to be at our best." Motherwell manager Ian Baraclough enjoys a pre-match cuppa after the epic, arduous journey across Lanarkshire to Hamilton.Image caption: Motherwell manager Ian Baraclough enjoys a pre-match cuppa after the epic, arduous journey across Lanarkshire to Hamilton. "Yogi [Hughes, ICT boss] did have a fantastic season last year. He turned it around very well. But my concern is what we do here today. I'm still here, that's backing. For me, we should have won the last game very comfortably. The most important thing is that the club moves forward. We have hit a sticky patch and we'll all come through it together. We have the ability, but we are lacking confidence to see things through, with other things going on." Rangers manager Mark Warburton is looking for his seventh league win in a row, away to Dumbarton. Jim McIntyre has been forced into two of his three changes for County as Rocco Quinn is out for six weeks after tearing a hamstring at Fir Park last week. Influential centre-back Andrew Davies is also sidelined with injury while Jonathan Franks drops to the bench. Experienced defender Scott Boyd returns as do Martin Woods and striker Brian Graham. "Kilmarnock searching for their first home win of the season. St Johnstone are looking for their first away win of the season. Draw then?" Jags boss Alan Archibald makes two changes to the team beaten by Dundee last weekend as Danny Seabourne and Sean Welsh are back from the start with Liam Lindsay and on loan Robbie Muirhead dropping out. In the Championship, Alloa take on Falkirk, Rangers are at Dumbarton, Livingston welcome Hibernian and Queen of the South are up against Morton. We have four matches in the Scottish Premiership, as many in the Championship and a full card in Leagues One and Two. In the top tier, Dundee United take on Inverness CT, Hamilton host Motherwell in the Lanarkshire derby, Kilmarnock and St Johnstone go toe to toe and Ross County welcome Partick Thistle. Welcome to BBC Scotland's coverage of today's football action across the country. The sun, it seems, is out north, south, east and west. What's more, we have three o'clock kick-offs! Perfect! Now let's hope for some goals.